As a startup business owner you face a number of challenges in growing your business. Most likely there’s a lot of uncertainty about profitability and time to market. You want to grow and expand, but you are also concerned about keeping overhead low. That’s why so many startups are turning to a BPO (business process outsourcing) company as a convenient, cost-effective way to scale up quickly without losing any flexibility. When considering the cost benefits of in-house vs remote workers, many only think about the direct wages as the savings. They fail to take into account the other savings that include facility costs, benefits, unemployment, HR, payroll and rising minimum wage legislation. When you consider all of these factors, the true cost of an in-house employee can be almost double to that of an outsourced employee. A BPO like Reps Direct not only has all the cost benefits of traditional outsourcing, but encompasses many hidden benefits which you can see from the chart below. 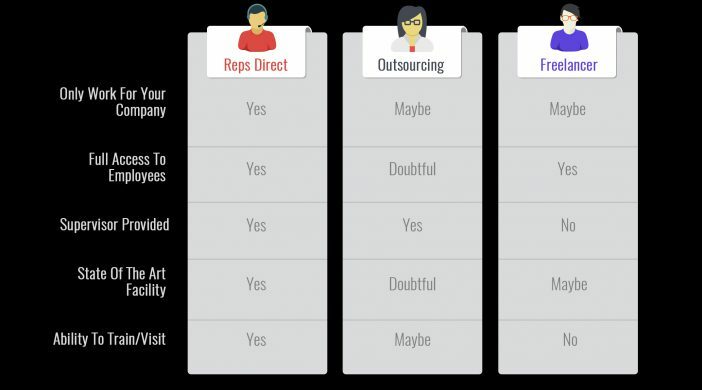 This chart show the differences between a BPO like Reps Direct and traditional outsourcing and freelance workers. A BPO can be different from traditional outsourcing in that the employees work exclusively for your company. With other staffing structures, the staff you hire could be working for other companies at the same time, and possibly even for your competitors. The exclusivity not only helps with productivity, but with the quality of work being done as well. Staff are only focused on working for you, so they will quickly learn and understand all of your needs and processes. Another huge advantage is having direct access to your staff. Unlike typical outsourcing arrangements that limit your access to your “employee,” you have full access so that you can train them one-on-one, virtually via video, conferencing or messaging. At Reps Direct we even encourage companies to come to the center and do in-person training. We are very proud of our state of the art facility and love when clients come visit. The best reason for hiring remote staff through a BPO is the talent of the workers. In the war for talent, it’s hard to find, hire, train and retain the best talent in the booming US job market. There’s constant turnover, as employees are always seeking out better offers elsewhere. Losing employees is very expensive and time consuming for your company. At Reps Direct we have very little employee turnover so you can rest assured that your employees will be with you for the long haul. In the event there is turnover you don’t have to worry about the dreaded hiring/training process, as we will seamlessly have someone new in place for you. Scaling can also be done much quicker and easier, which is important to growing companies. There is another factor that affects the quality of workers that most do not think of, and that is location. In developing outsourcing markets like Latin America, you will find that the quality of work is typically better. These countries have a very talented workforce, but are not flooded with hundreds of companies. This means the workers that are being utilized are the best of the best. In traditional outsourcing countries like India and the Philippines, the work force is saturated and new clients are stuck with bottom tier workers. When you take all factors into consideration, remote staffing makes the most sense when it comes to cost savings, flexibility and talent. You can reduce staffing costs, make your company as agile as possible, and still have access to talented employees. You’ll have a competitive advantage on your peers and be better positioned to disrupt whatever industry your startup is in! At Reps Direct we are so confident in our talent that we do not make you sign any long term contracts or require minimums on the number of people you employ. If you are ready to learn more about our services at Reps Direct CONTACT US now or give us a call at 702-251-9244 and we can answer all your questions. Build your team and scale your business with the right BPO partner.